080808 On,Now,To the Third Level: where are YOU,where is your true PERSON? When the woman saw that the tree was good for food, and that it was a delight to the eyes, and that the tree was desirable to make one wise, she took from its fruit and ate; and she gave also to her husband with her, and he ate. 7 Then the eyes of both of them were opened, and they knew that they were naked; and they sewed fig leaves together and made themselves loin coverings. 8 They heard the sound of the Lord God walking in the garden in the cool of the day, and the man and his wife hid themselves from the presence of the Lord God among the trees of the garden. 9 Then the Lord God called to the man, and said to him, “Where are you?” 10 He said, “I heard the sound of You in the garden, and I was afraid because I was naked; so I hid myself.” 11 And He said, “Who told you that you were naked? Have you eaten from the tree of which I commanded you not to eat?” 12 The man said, “The woman whom You gave to be with me, she gave me from the tree, and I ate.” 13 Then the Lord God said to the woman, “What is this you have done?” And the woman said, “The serpent deceived me, and I ate.” 14 The Lord God said to the serpent,etc......working out from the root as He does today. Now the Lord said to Moses and Aaron in the land of [a]Egypt, 2 “This month shall be the beginning of months for you; it is to be the first month of the year to you. 3 Speak to all the congregation of Israel, saying, ‘On the tenth of this month they are each one to take a [b]lamb for themselves, according to their fathers’ households, a [c]lamb for [d]each household. 4 Now if the household is too small for a [e]lamb, then he and his neighbor nearest to his house are to take one according to the [f]number of persons in them; according to [g]what each man should eat, you are to [h]divide the lamb. 5 Your [i]lamb shall be an unblemished male a year old; you may take it from the sheep or from the goats. 6 [j]You shall keep it until the fourteenth day of the same month, then the whole assembly of the congregation of Israel is to kill it [k]at twilight. 7 Moreover, they shall take some of the blood and put it on the two doorposts and on the lintel [l]of the houses in which they eat it. 8 They shall eat the flesh that same night, roasted with fire, and they shall eat it with unleavened bread [m]and bitter herbs. 9 Do not eat any of it raw or boiled at all with water, but rather roasted with fire, both its head and its legs along with its entrails. 10 And you shall not leave any of it over until morning, but whatever is left of it until morning, you shall burn with fire. 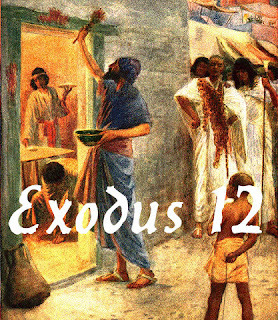 11 Now you shall eat it in this manner: with your loins girded, your sandals on your feet, and your staff in your hand; and you shall eat it in haste—it is the Lord’s Passover. 12 For I will go through the land of Egypt on that night, and will strike down all the firstborn in the land of Egypt, both man and beast; and against all the gods of Egypt I will execute judgments—I am the Lord. 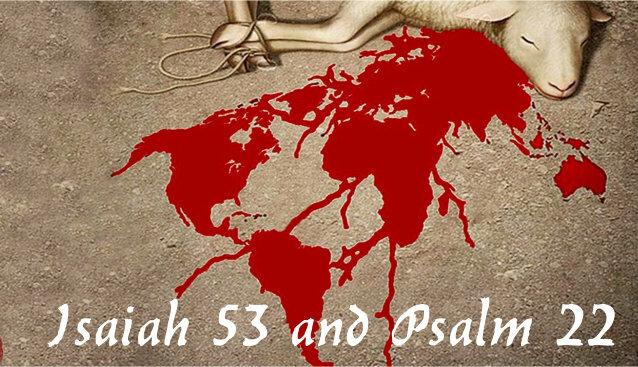 13 The blood shall be a sign for you on the houses where you [n]live; and when I see the blood I will pass over you, and no plague will befall you [o]to destroy you when I strike the land of Egypt. In the writings Of Paul We see there is yet more to the depth of Jesus sacrifice. In the Old Testament there is currently some confusion over the translation of Azazel in Leviticus 16.8 , which relates to the second goat. Some modern scholars say King James translation wrongly translated Azazel as meaning scapegoat. The word 'scapegoat' is an English translation of the Hebrew azazel (Hebrew: עזאזל) which occurs in Leviticus 16:8. The lexicographer Gesenius and Brown–Driver–Briggs Hebrew Lexicon give la-azazel (Hebrew: לעזאזל) as a reduplicative intensive of the stem azel "remove", hence la-azazel, "for entire removal". This reading is supported by the Greek Old Testament translation as "the sender away (of sins)". Alternatively, broadly contemporary with the Septuagint, the pseudepigraphical Book of Enoch may preserve Azazel as the name of a fallen angel. "And Azazel taught men to make swords, and knives, and shields, and breastplates, and made known to them the metals of the earth and the art of working them, and bracelets, and ornaments, and the use of antimony, and the beautifying of the eyelids, and all kinds of costly stones, and all colouring tinctures." English Christian Bible versions traditionally follow the translation of the Septuagint and Latin Vulgate which interpret azazel as "the goat that departs" (Greek tragos apopompaios, "goat sent out", Latin caper emissarius, "emissary goat"). William Tyndale rendered the Latin as "(e)scape goat" in his 1530 Bible. This translation was followed by following versions up to the King James Version of the Bible in 1611: "And Aaron shall cast lots upon the two goats; one lot for the Lord, and the other lot for the scapegoat." Several modern versions however either follow the reading as a demon, Azazel, or footnote "for Azazel." as an alternative reading. Jewish sources in the Talmud (Yoma 6:4,67b) give the etymology of azazel as a compound of az, strong or rough, and el, mighty, that the goat was sent from the most rugged or strongest of mountains. From the Targums onwards the term azazel was also seen by some rabbinical commentators as the name of a Hebrew demon, angelic force, or pagan deity. The two readings are still disputed today. The very same devil who muddies the waters and who keeps us from ever finding out about our true identity as Vessels or containers, for one divinity power or the other.....not least in our day , by disavowing spirit altogether by virtue of a skilfully woven science teaching that says only what is seen and testable is true. So the essence of us is now taught as the biology of us, two hemispheres of the brain. Why should this be such an issue? Because Day of Atonement teaching in the Spirit, if not in Judaism, is the rediscovery of the FULL NATURE of the deliverance Jesus has wrought on our behalf. What we can see though is as ever a muddying of the waters, but both sides are not wrong. One emphasises the practice of scapegoat, the other declares deliverance from this being known as Azazel, or place named after this spiritual entity. What Paul is preaching is that God's salvation includes the death and carrying away of the old man, the old me. Which is why none of us are duty bound to sin anymore.We begin this mystery of walking Christ in my members as me, by faith. And what begins in the cold as "faith" without sight, is confirmed to me by the Spirit with a flow of new creation life, and inner knowing. Christ in us the hope of glory. The Levitical priesthood was one complete infrasctructure. But God quite deliberately chose Jesus out of the tribe of Judah. He was not a Levite. I have come that you may have life, and life more abundantly.